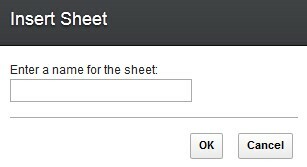 You can insert a sheet into a spreadsheet. Click the sheet tab after which you want to insert a sheet. Click Insert > Sheet. You can also right-click the sheet name and select Insert. The Insert Sheet window opens. Name the sheet and click OK.